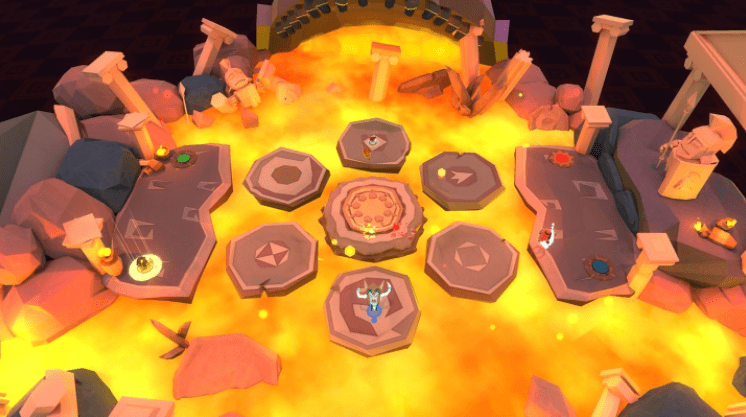 Oh My Godheads is an indie local multiplayer title that features the heads of mythological Gods as the collectible, in an original take on classic objective-based multiplayer arena modes. You know, because Capture the Flag was so last year. 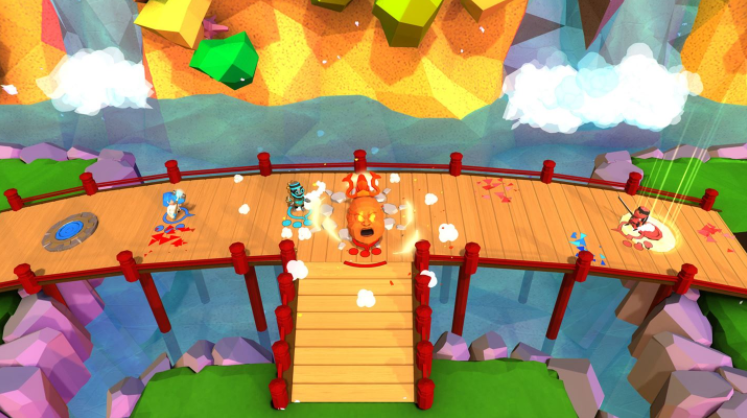 Inspired by old school classics such as Micro Machines, Worms and Street Fighter, Oh My Godheads, developed by Titutitech based in Barcelona, aims to recreate the feeling you got when defeating your friends in the same room. But it also offers an interesting art-style with the environments and characters being polygonised, whilst retaining a cartoon like aesthetic. The character models are all as weird and wacky as the game would suggest, with them including a skeleton, nods to Indiana Jones and Lara Croft and my personal favourite, a penguin wearing a top hat and smoking a pipe. Godheads keeps things fresh and interesting by offering a few different modes to choose from: Capture the Head is very much a Capture the Flag mode that requires players to pick up and control the head. King of the Head requires players/teams to hold on to the head for as long as possible to score a point. Headhunters is a standard deathmatch mode and Last Man Standing is just that. There is also a single player mode that offers trials to be completed and then gives a grade on your performance. There are different traits to each Godhead and it is useful to learn the specifics of each, as they can be vastly different and game-changing. These traits are where the game offers a bit of variability. Some may give off shockwaves to keep players away, whilst others will explode or turn people into ice cubes if held for too long. Without these traits – and a small choice of maps – this game would lack variability altogether from other, better, local titles out there already. The Godheads themselves are all based on real-life mythological Gods, ranging from Irish folklore to Japanese mythology via the Greeks, and the visual representation of each is akin to their representation in their respective worlds. But I only know this from looking online as this information isn’t really presented in the game. I for one would have enjoyed a bit of backstory to them all. The action within is fast-paced and frantic. You have a number of different attacks to choose from including a dash attack and jumping attack. 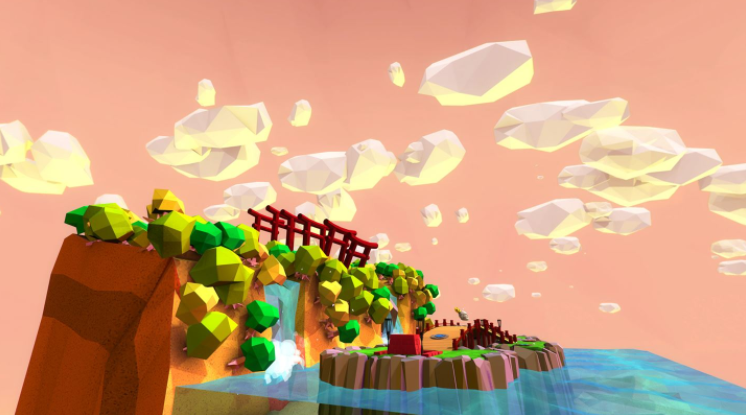 Pickups are also dotted around the arenas, and these can offer ranged options through bombs and explosive projectiles from the sky – strangely, explosive pies. With such a huge emphasis on local-multiplayer – even the main loading screen settles on characters from the game sitting on a sofa all playing together – there just seems to be a lack of modes on offer. With only four options available for those looking to enjoy the multiplayer and a price tag of £10.99, it would be fair to expect at least one or two more. Oh My Godheads teaches you how to pass the head between players by using the right bumper but this could have been used more than just as a tactical element. For example, if only there was a 2v2 game mode like tennis or volleyball with the passing technique in use primarily to throw heads over the net and score points against your opponents. Sticking with the ability to create a 2v2 game, it is definitely worth pointing out how easy and intuitive the lobby screen is. It’s super easy to create a game and choose a team colour or allow all to play individually and this needs commending. There are also unlockables in the game, depending on how many of the single-player trials and number of matches you have completed, but one of these unlockable Godheads is a simple flag. Unlocking this, and then using it, negates anything good that allows the game to stand out from the rest. I don’t know if this has been included as a joke or not. There is also a lack of togetherness about the whole thing. By this I mean that once a match is over and the victor has celebrated, you have the option of a rematch, choosing a different level or heading back to the main menu. The latter comes with a stats section where you can view session stats across all players and who is leading overall – providing you can figure out who is who as they are simply referred to as P1, P2 etc. rather than gamertag. This kind of information really should be front and centre after each match to keep the rivalry going. 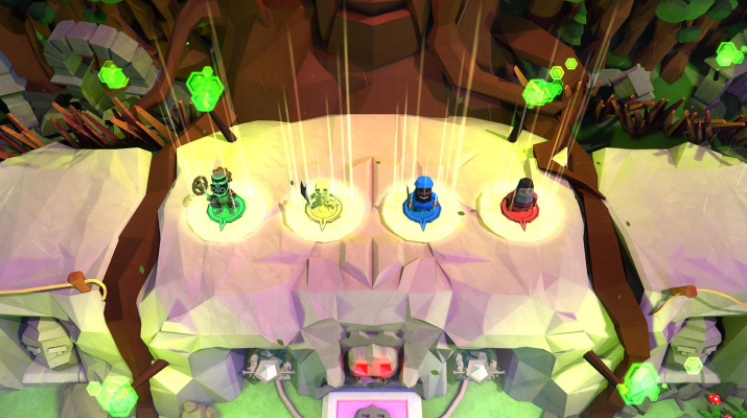 As a result, Godheads just feels like a batch of single matches without an overarching leaderboard and overall winner. This in turn will decrease the amount of time spent in the game as you do not ever feel like you are working towards anything in terms of an overall score. What I did notice though – when playing as a group – was that all my friends were nodding and tapping along to the in-game music. Then I realised I was doing the same to this horribly catchy music. Horrible in how catchy it is, but not horrible in sound. It’s pretty good actually. Oh My Godheads offers a fun gaming experience for an hour or two at best. Having timed one session, it took just over 16 minutes to play every multiplayer game once, with the most enjoyable ones strangely being those not involving the Godheads. Had this game been priced accordingly I could easily recommend it, but with what you get and the price at £10.99, I would highly suggest looking elsewhere for a local multiplayer fix before considering Oh My Godheads. Next articleRaiders of the Broken Planet Wardog Fury release date and details confirmed – Available now!